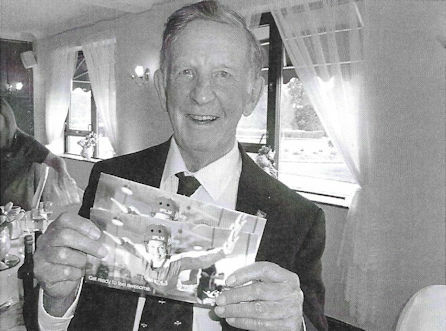 Since our last report we sadly lost one of the branch stalwart member, Phil Eccleston. Phil passed away in August having suffered a severe relapse following major surgery. More positive news is included further into our report. 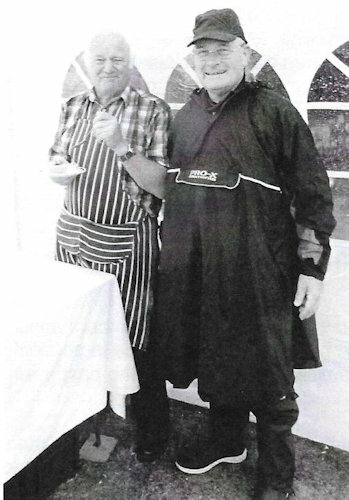 Our annual BBQ, once again hosted by Betty & Fred Gray, was held on Sunday 26th August (the Bank Holiday weekend). Some may recall that the south of England has been experiencing glorious sunny weather week after week. And so it was on the Saturday and again on the Monday — but — on the scheduled day of our BBQ it started to rain about 10:00 am. By midday it was absolutely pouring down. But with Bulldog spirit the event went ahead. It was most surprising that each and every one who had booked to attend duly arrived, dashing from their cars into the small marquees and tents erected in Fred's garden. Overhead protection was also provided for Chef Tony Manley and me, so we too managed to remain completely dry. Of course some, having studied the forecast, came fully prepared. Chris & Jenny Davies were taking no chances as shown in the photo. The raffle receipts, (£160) as previously agreed, were donated to the Phyllis Tuckwell hospice in Farnham. Following this rather damp experience it has been unanimously agreed that in future we shall program the BBQ in accordance with the weather forecast. 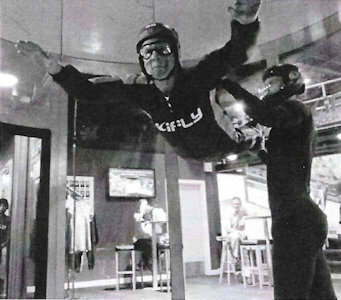 Our president, Sir Donald Spiers, using the prize won at our Spring lunch, made good his promise by attending an indoor skydive experience in Basing­stoke. What surprised him most was that his instructor had never actually made a parachute descent! Shortly after Phil's passing, Jeannette and I visited Gay Eccleston. During our time there we were requested to find suitable 'homes' for numerous items belonging to Phil. These included a G1098 watch, blazer, car badge and many other military related items. Gay suggested that any money raised for these items be donated to BLESMA. During the Gala dinner at Chatham, the auctioneer prowess of Mick Humphries sold the G1098 watch to Ralph Young, a long-time friend and colleague of Phil for £155. Displaying Phil's blazer and many other military related items in the AEA shop, Jeannette raised yet a further £105. With a grand sum of £260 a cheque made payable to BLESMA was presented to Gay at our branch meeting on Sunday 28th October. Speaking on behalf of the branch members who attended the 2018 AGM/Reunion hosted by the Chatham branch, we extend hearty congratulations on a super weekend. Our only fear is that we have to follow your act in hosting the 2019 event. Well done Chatham branch, we thoroughly enjoyed the whole event! weather is usually at its worst. A hasty show of hands at the December meeting, the members opted for Sunday 11th March, however as we approached that particular date it was suddenly realized that this would clash with 'Mothering Sunday' - and so our meeting was postponed until the following Sunday. Nobody warned us that the 'Beast from the East' would dump some 6" of snow onto the Aldershot and surrounding areas on Saturday evening making travel the following morning almost impossible for many of our members. More frantic phone calls and the March meeting was delayed yet again. We finally held a very successful re-scheduled meeting on Sunday 25th March. Our Spring lunch held on Saturday 8th April at the Oak Park Golf club was organized by our entertain­ments member, Dave Leibrick. Working quietly behind the scenes he planned and coordinated an extremely well executed event. He had developed a good working relationship with the 'Clubs events manager who in turn set out the dining room, table plan and place names. 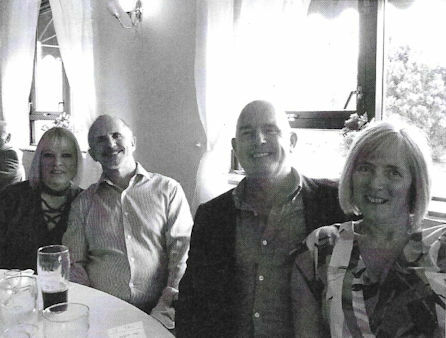 Our guest included Adam & Emma Frame (from Yorkshire), Jim & Karen Doubtfire, Mark & Paula Desborough & Mick Bateman. Unfortunately, due to slight health problems, Tim van de Kraan and partner Edwina Ball together with Sally Wilson had to submit their apologies. At a previous meeting the members had voted to donate the raffle proceeds to SSAFA. In charge of the ticket draw Mark Desborough offered plenty of banter. Prizes, donated by the members were plentiful, but the 2- Star prizes were kept until last. I believe Dave Leibrick was responsible for organising these. The first star prize of an indoor sky dive for two persons was won by our President Sir Donald Spiers. He later informed me that he fully intends to participate in this sport and will select one of his grandchildren to accompany him. 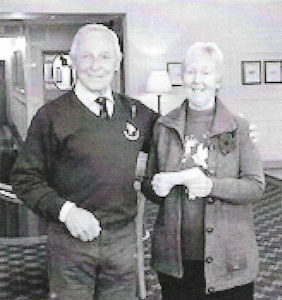 The second star prize for a round of golf for 4 players at the Oak Park Golf Cub, was won by Paula Desborough. Not surprisingly she received numerous volunteers wishing to join her on the golf course. The raffle raised £245 which, as previously mentioned is to be donated to SSAFA. It is with much regret that we close on a somber note. Jan Chambers, a long standing stalwart of the Airborne Engineers Association, sadly passed away on Thursday 12th April. Many will recall that Jan ran the AEA shop for many years and just as importantly was a leading committee member of the Double Hills Commemoration society. A lady truly dedicated to the good and well-being of the AEA and Airborne Sappers. She will be sadly missed by us all. Our most sincere condolences are extended to husband Chris, daughter Kelly and son Sean. With many commemoration events held throughout the summer and autumn months many of our members have traveled near and far to attend these gatherings. The Falklands 35th Anniversary commemoration was held in Aldershot during the weekend 17-18 June. Being on our doorstep, many branch members joined in with the commemorations, taking the opportunity to meet and greet former colleagues and friends. 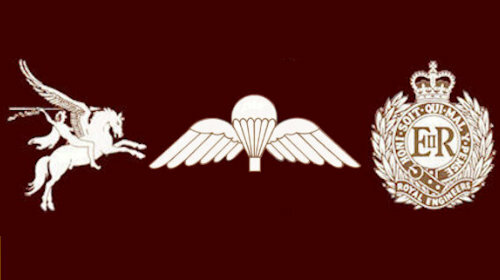 The local pubs and bars on Saturday were crowded with Falkland veterans and serving representatives from 23 Para Engr Regt, the Parachute Regiment and many other units and associations. It was all reminiscent of an 'Airborne Forces weekend' of yesteryear. The Sunday program commenced in the morning with a Drumhead Service held in the Aldershot Cemetery. 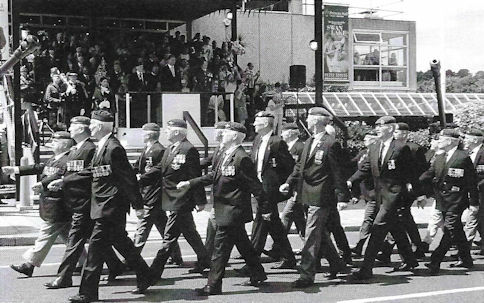 Later in the early afternoon, serving units, veterans and other associations formed up in front of the Aldershot Princess Hall before stepping off, led be the band of the Parachute Regiment, through the main streets of the town. Thousands of spectators lined the route and gave a rousing rounds of applause as each of the units marched past. Henry Cooper, Geoff Barlow, Mick Humphries & Chris Davies march past the saluting dais. 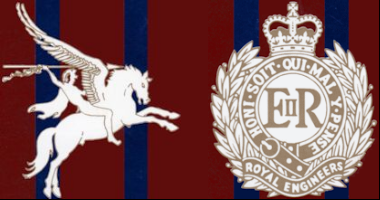 Dismissed from the parade, the local pubs and bars were soon filled with individuals in various coloured berets and cap badges quenching their thirst and reacquainting themselves with former colleagues and friends. Various branch members have also attended commemoration events at the National Arboretum, Double Hills and Arnhem. On a lighter note, we once again held our annual BBQ in the gardens of Fred and Betty Gray. Fred and a team of helpers, mainly from Fred & Betty's family, erected a small marque and other tentage to accommodate the 40+ attending. With hindsight they needn't have put themselves to so much work as the weather on the day was absolutely scorching hot. Most used the cover to shelter from the sun. Once again the BBQ was a great success and much praise was given to Tony our chef and to the ladies for providing the large variety of salads etc. Our raffle raised £150 and as previously agreed at a branch meeting, the funds were donated to the "Falkland Islands Memorial Chapel Window Restoration Fund Appeal". This together with a previous donation to "Veterans in Action" brings our total contribution to charities throughout the year to £450.00. On a welfare matter, we helped one of our member's wife in seeking the assistance and guidance from the Guildford SSAFA chairman, for her husband whose medical condition was causing concern. She has been delighted in the guidance and assistance provided by SSAFA. You will have noticed that a letter of introduction from SSAFA has been included in this issue and it is hoped that this information will be taken on board by all readers in need of help.